I am very excited to announce that I will be a guest at the NECSS conference in New York in September! NECSS (pronounced “nexus”) was born out of the desire to hold a major skeptical gathering on the East Coast of the United States, specifically in New York City. As its name suggests, NECSS seeks to explore the intersection of science, media, education, politics, and popular culture, and examine how we may best utilize that understanding to promote a more rational world. 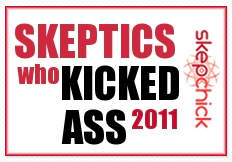 NECSS is produced by the New England Skeptical Society and New York City Skeptics. Location: Florence Gould Hall at the French Institute, 55 E. 59th St. New York, NY (between Madison and Park Avenues). See the website for ticketing and more information. I will be heading to NECSS after Dragon*Con which is held on the Labor Day weekend (September 4 – September 7, 2009) in Atlanta, GA, USA. Here, I will be on four panels with the likes of James Randi, Steve Novella and of course Richard Saunders and Kylie Sturgess. Phew!